Here are my top ten restaurants in Riyadh. There are so many good restaurants it’s not easy to pick only ten! I am always amazed to see restaurant reviews on sites like Tripadvisor and others. They have stuff like McDonalds, Chilis and TGI Fridays and various average burger and pizza places on the top of their lists. I would not place those places in my top 100. I would not even call McDonalds a restaurant! So what makes a great restaurant? It’s not only the good food, but the atmosphere, ambience, decor and service are all very important too. 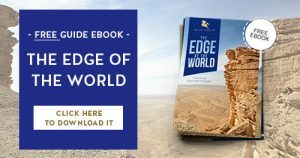 Some restaurants in Riyadh are ridiculously overpriced for what you get in return and you’ll find they are not included in this list. Restaurant in Riyadh are not in any particular order. 1. Il Terrazo Brazilian restaurant in Faisaliyah hotel. Situated on a terrace overlooking the Globe and the Faisaliyah courtyard fountains, this is a buffet restaurant serving a multitude of meats barbecued on the open grill. Good music, relaxed atmosphere, heavenly food, excellent Saudi “champagne”, no gender segregation. 2. Tao Lounge on Tahlia street. The ultimate hip hangout for the trendy complete with high ceilings, comfy sofas, unbeatable ambiance and excellent international cuisine. Update: Bistro by TAO at Najoud mall is worth going to for some delicious cakes and specialty desserts, innovative and creative menu. 3. Lenôtre restaurant in Centria Mall. The famous French restaurant branch in Riyadh can be found on the third floor of the mall. 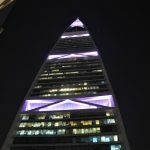 They have a wonderful outside terrace overlooking both Faisaliyah and Kingdom towers. Delicious food and heavenly desserts! Owned by a Princess, and it is one of the few places in Riyadh where women can dine outside. 4. Najd Village Restaurant next to Prince Sultan university. This is THE place to go for expats in Riyadh and also popular with locals. The restaurant is built in a traditional Saudi house and serves original Saudi cuisine. An experience not be missed especially for first timers in Riyadh! read more form this post: Al Qaryah Najdiya- Najdi Village Restaurant. 5. Rosso Italian at Four Seasons Riyadh- five star service and five star delicious food cooked by Italian chefs. 6. PAUL on Tahlia street. 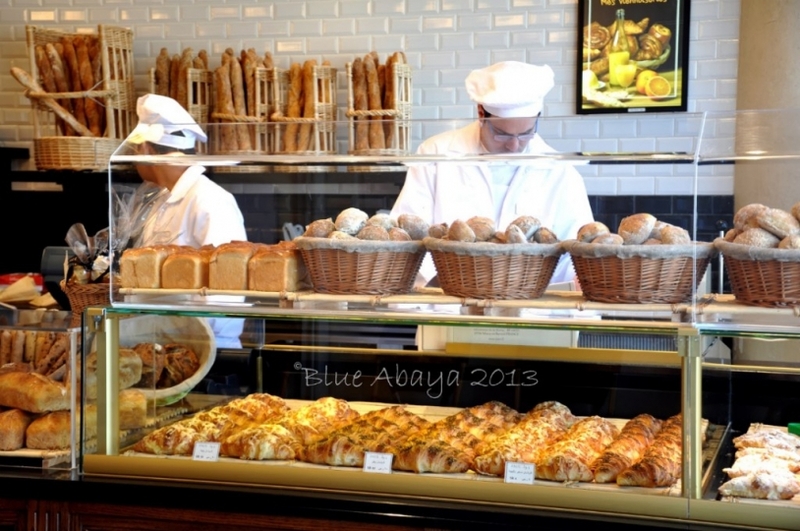 Especially lovely place to have breakfast, freshly baked croissants and breads from the famous bakery. Outside seating area is also open to ladies. 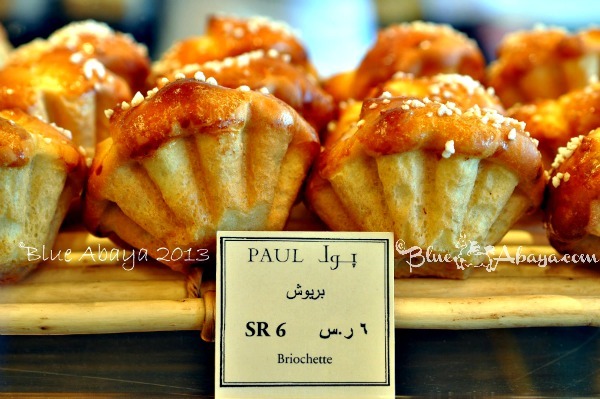 Read a detailed review here: PAUL Restaurant and Bakery Riyadh. 7. Maya Chocolaterie on Tahlia street. A chocolate lover’s paradise. This restaurant is all about chocolate, they even have liquid chocolate flowing in pipes! Indulge in heavenly fondue, rich aromas of the desserts, exquisite chocolate delicacies and get on a sugar high! 8. Mirage Chinese restaurant. Asian cuisine in a delightful setting, large fish tanks all over the restaurant will keep the kids busy. Guests can dine in chalets set over small pond with large goldfish in it. 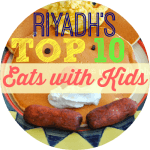 For a list of the Top restaurants to take the kids in Riyadh click here! 9. Nozomi, Tahlia street. Chic, low key ambiance, delicious sushi, fantastic service, gorgeous setting. For a list of the Top most romantic restaurants in Riyadh, check out this post: Top 14 Most Romantic Restaurants in Riyadh. 10. Elements in Four Seasons Kingdom Center. A new restaurant with an exiting concept of four different interactive open kitchen stations. Very impressive modern decor and relaxed atmosphere. For families they have amazing brunch with kids own buffet and play area on Fridays. 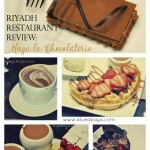 What is your favorite restaurant in Riyadh? For a complete list of Blue Abaya restaurant reviews click here! If you’re in the Eastern Province, here is a list of the Top 10 restaurants in Dammam, Khobar, Dhahran and Jubail: Top Ten Restaurant in the EP. Make sure to stay tuned for more great restaurant updates by Blue Abaya by subscribing with the form below! Maya La Chocolaterie- Chocolate Lovers Heaven! riyadh must have hundreds of hamburger places! seems the saudis are crazy about burgers and do not appreciate other kind of food too much. though not a luxury place or a place for a night out,i do love thier food,probably the only place that offers mexican food, its called Amigos,its on the street where tamimi is in King abdulaziz street if i remembe right. Dentographer-thanks for the hint I will check that one out! Haven’t found a decent Mexican yet! They are all my favourites. I like Diamond, Noodle House, Avadh & Copper Chandni too. Lusin is good when the chef and cooks are in a good mood. They are often out of several items on the menu and lack consistency in quality and inventory. I left Riyadh allmost five (!) years ago after spending there wonderfull three years. I still miss Riyadh! I still remember TAO-restaurant and the delicious Chocolate-fondue! There was one good Turkish restaurant…and a Moroccan. I left Riyadh five years ago after spending there wonderfull three years. 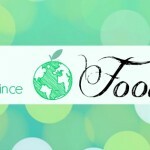 The Brazilian and the TAO-restaurants where on my top ten restaurants. I whish I could visit them one day! Still remember the delicious chocolate-fondue! There was also a good Turkish and Moroccon restaurant. I miss Riyadh!!!!! Hopefully I get to visit those restaurants when I get back! Such inspirations. Thanks for being a proper insider source on Riyadh! I’m a consultant working between Riyadh and Dubai, and looking to take my Saudi client team out for a business lunch. We’re tired of hotels and looking for something a bit more Middle Eastern, but not as fully cultural as Najd for example.